My Aunt - artist, mathematician, and tea lover - was kind enough to take us on a tea tour of her neighborhood while we were visiting for her solo show (she's a plein air painter, and her work is wonderful). One of our stops, One Good Woman in Camp Hill, is also home to our sip of the month. Since my Aunts last visit they've moved into a larger building, with more room for their tea, coffee, and culinary gift items. There are three walls of tea at the back of the store in large jars with detailed labels, organized by kind: herbal, black, white, green, blended, etc. when you've found what you like, there's a friendly tea-bar attendant who pulls the jars and measures out whatever quantity you need. I went in with the intention of picking up a breakfast tea, but left with some surprises (Yunnan, a couple puerh pucks, and a pan fried green tea- notes to come). There were plenty of breakfast blends to choose from, and I settled on the Russian Country blend. 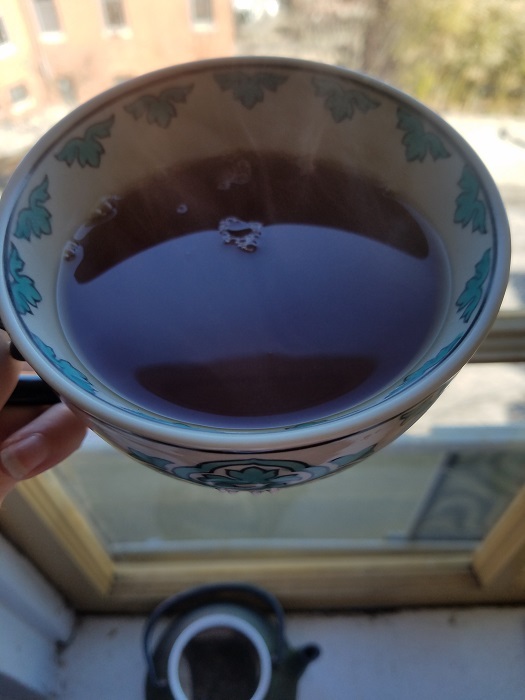 A smoky tea sounded like just the thing to help brace against 6 more weeks of winter. The tea is a blend of black tea with lapsang souchong. The dry leaves are dark, foggy blacks, browns and faded pine in color. The leaf shapes are varied - mostly 1mm long, bent, thin, and twig like pieces. They smell sweet and smokey - like a savory honey glazed ham. I steeped 2 spoons to a pot (my pot serves 4 tea cups, or 2 mugs) for 4 minutes. The wet leaves smell less sweet than the dry, and earthy - after unfulling in the water, they appear choppy - like parsley. The tea liquer was thick, and a warm burnt sienna - with purple-red undertones. As for the taste, I wasn't disappointed. The black teas came forward with a touch of smokiness from the lapsang. Other notes: definitely not as pungent as straight up lapsang, round and a little toothy, bitter as it sits on the tongue. Otherwise, an even blend that would compliment a biscuit with jam nicely.